A few days ago, I bought a cheap bottle of Cabernet Sauvignon from the local supermarket, with the initial intention of drinking it as a casual dinner wine. It turned out to be pretty bad for that purpose, and simply wasn’t going to be enjoyable, so i decided to use it to cook. That’s all there is to it! While the cooking time is long, you really only need to check up on it once in a while, so it’s not actually all that much effort and you can be doing something else while it cooks. Bon appetit! Preheat a large skillet or nonstick saute pan over medium-high heat. Cook the bacon until the fat is rendered and the bacon is crisp. Remove the bacon with a slotted spoon. Set aside and leave pan on the heat. 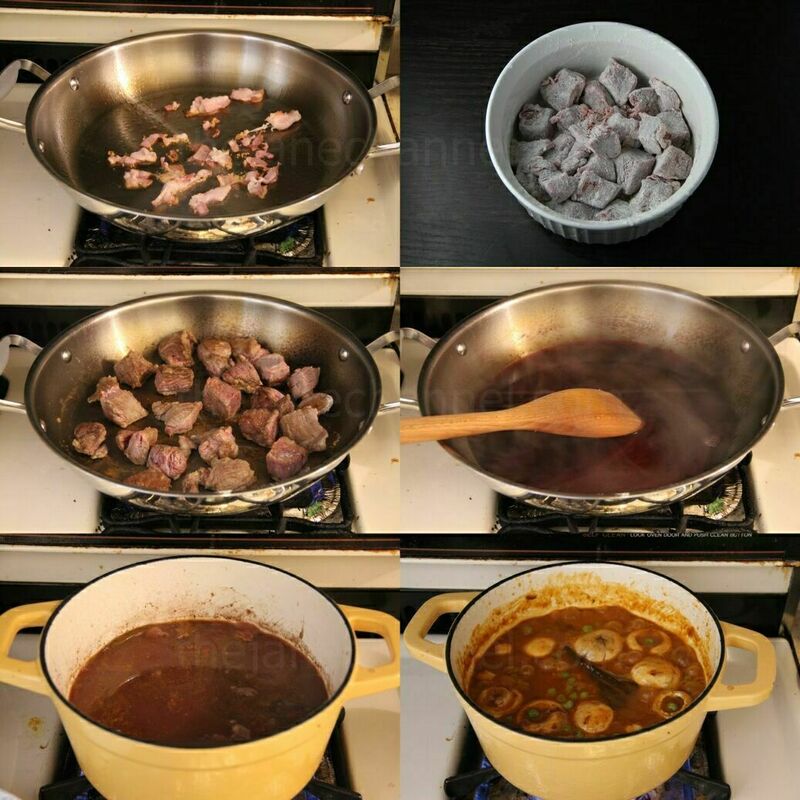 Combine the flour, salt, pepper and beef in a small bowl, until the pieces are lightly covered with flour. Add the beef to the hot pan and cook until all sides are golden brown. Remove the beef and add to a slow cooker. When all the beef has been browned, add 1 cup wine to the hot pan and scrape up any brown bits from the bottom with a wooden spoon. 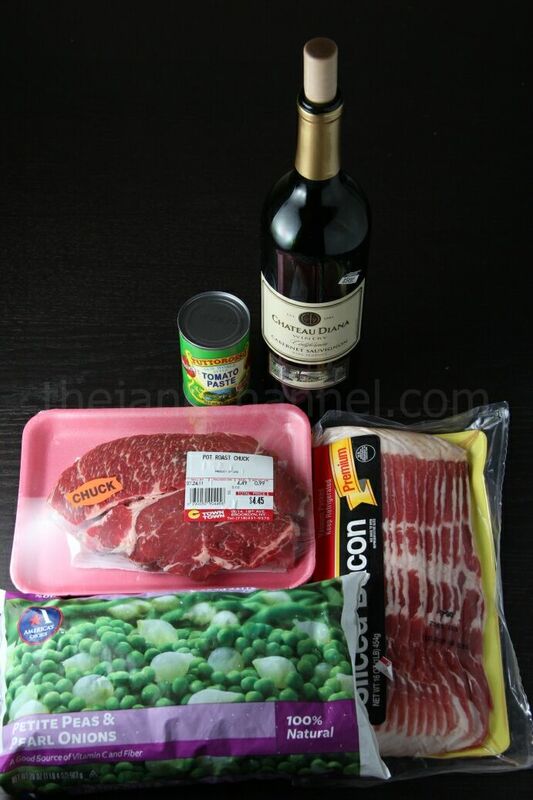 Pour over the beef, along with the rest of the wine, the broth, the tomato paste, bay leaves, and bacon pieces. 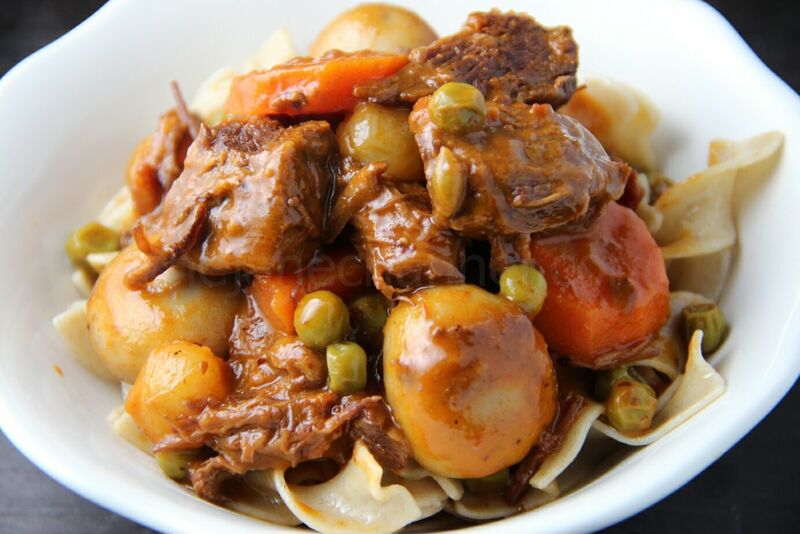 Set the slow cooker to high and cook for 3 hours, until the beef is tender and falls apart with pressure from a fork. In the last 30 minutes of cooking, add, carrots, pearl onions and mushrooms. Right before serving, add the peas and simmer for a few minutes to cook through. Discard the bay leaves. 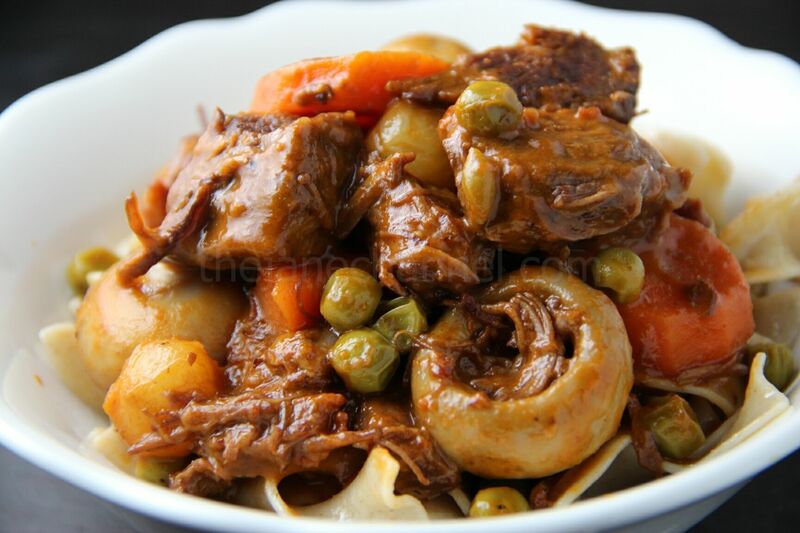 Serve the stew by itself or over mashed potatoes, egg noodles, rice or with french bread. Source: Cook This, Not That! with modifications.